The 15″ MBP now features a Force Touch track pad, first seen on the new 12-inch MacBook released in April – supporting a range of new gestures thanks to the built-in force sensors. In addition, a new AMD Radeon R9 M370X graphics card replaces the nVidia 750m series and the battery life has been extended by an hour – now offering up to 9 hours. 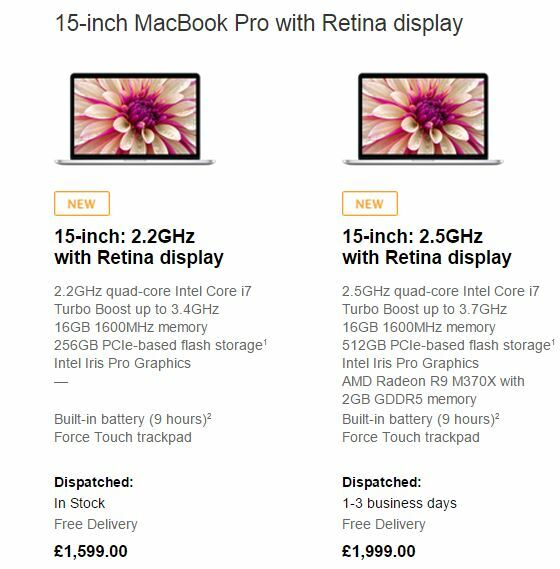 The new MacBook Pros come in two models, priced at £1,599 and £1,999. Although if you really want to splash out, the top-end model can be upgraded to include a 2.8GHz i7 processor and 1TB Solid State Drive for a further £550. How does the R9 M370X compare to its predecessor, the NVIDIA GeForce GT 750m? Apple claim a 70-80% performance boost which will be great for gamers and power-users. This is still a relatively mid-range graphics card though, and some users will be disappointed not to see a more powerful card, like the GeForce 970M for example – especially on a laptop costing the best part of £2k. 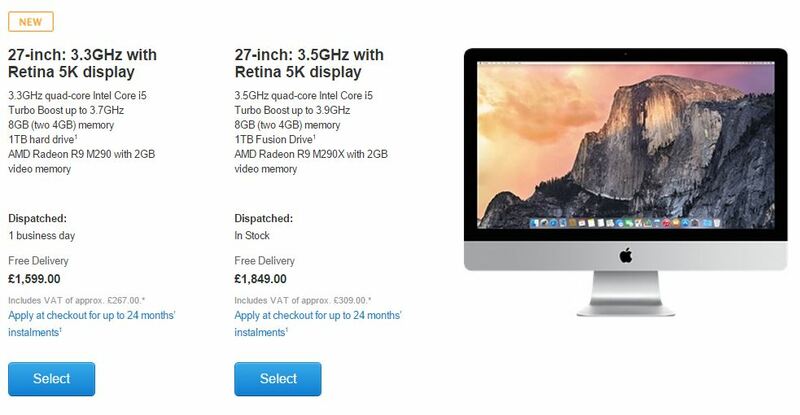 Apple has reduced the price of the Retina Display 5K iMac line, with prices now starting from £1,599 and rise to £1,849. The top-end model offers a 3.5GHz processor, R9 M290X graphics card and a 1TB Fusion drive. Like the MacBook Pros – there’s room to upgrade the iMac even further. Overclocking the processor to 4GHz, increasing the RAM to 32GB, adding a 1TB SSD and upgrading the graphics card to a R9 M295X will see the price rise to an eye-watering £3,369. Aside from the new graphics card in the MacBook Pro – this is a fairly modest update. We are still seeing the same 4th generation Haswell processors and there’s no sign of any USB-C ports. However, if you have been holding out for a new MacBook or iMac now is a good time to pick one up as it’s unlikely we’ll see another significant refresh for at least 6 months – although that will probably be a more significant update and include the upcoming Intel Broadwell or Skylake chips. You can order the new MacBook Pro and 5k iMac right now from the Apple Store.